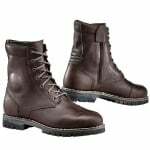 Comfortable out of the box, good grade leather well put together and can be used as a everyday boot if you want, would recommend. A good well made pair of boots, with plenty of comfort and plenty of ankle support.Excellent not only for riding but also stylish enough to walk around in. I really rate these boots. Straight out of the box they are comfortable and feel really stable. If I was being picky I'd say the benefit of being waterproof means that my feet don't breath too well in them, but I'm happy to compromise on that. So far they have been great as a style boot in good weather. Flexible and not too stiff from the off. Very nice boot straight out the box. Leather feels and looks great and I thought it was going to take a long time to break them in, but I was wrong. They are comfortable straight out the box. Went with the same size as I normally am, fit as expected. Really comfortable and the zip makes them easy to get on and off without faffing around with unlacing the boots. They look like normal boots and are really smart. Protection feels very sturdy and the soles are proper solid. Lovely job. Excellent biker boots. Look good & very comfy. Got my usual size & fit perfect. Comfy straight out of the box and true to size. Look good with jeans. Great boots, much more comfortable and stylish than alternatives. The side zip is a great feature - the boots can be removed by just using the zip. Only had a couple of weeks, so can't comment on durability, but so far so good. SBS service excellent as always.